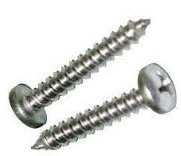 Self Tapping Screws or "sheet metal" screws as they're typically called, are normally Type A, Type AB, or Type AB tapping screws used in thin metal or resin-filled plywood. Type A self tapping screws have somewhat of a sharp point and have wider spaced threads than a type AB self tapping screw. Type B self tapping screws are sheet metal screws with a gimlet or blunt point and are used in molded or through holes in thin metal, non-ferrous castings, plastics or resin-filled plywood.